Obviously pumpkin ales are the best beers there are. Here are some links to my very favs! Until I married Kath, I wasn’t really into “The Flavors of Fall,” but man she sure makes you want to like ’em! So after lots of experimenting and exposure, I learned to love sweet potatoes, pumpkin pie, and maybe even sometimes some cinnamon in our meal (still need some encouragement on that one)! She loves practically everything about this season, but of course the onslaught of pumpkin ales are a particular reason for both of us to get excited. I’ve been homebrewing for two years now and have made a pumpkin ale of my own each time. I’d estimate I made it 75% for her and 25% for me. What does that mean? I put a lot more cinnamon, nutmeg, and allspice in than I ever would have in my own beer. It results in something that’s more of a dessert or a single serving. Compare this with a light wheat beer that quenches your thirst and you can drink 100 of them and not get too full or ruin your palette. In crafting the recipe, I first thought about the flavors, aromas, and textures that I wanted in the final beer, keeping in mind that ultimately a pumpkin ale MUST be orangey-reddish when it ends up in your drinking glass. There’s a lot of debating in the homebrew world about whether or not you should actually put pumpkin in a pumpkin ale. Sounds crazy, right? But it makes sense – pumpkin isn’t a very strongly flavored food. It’s even less flavorful when you dilute it in 5 gallons of liquid. And it’s even less flavorful when that liquid is beer. What a lot of brewers do is just add the typical pumpkin pie spices to their beer. Some commercial pumpkin ales are made this way. But I kinda feel like to have some legitimacy you have to put just a little real pumpkin in your batch so I go with about a couple cans in the mash. I did some research online to see what quantities and types of spices people were adding. Pumpkin pie is of course the model, so cinnamon is in almost every recipe, and nutmeg is a close second. Allspice is the next most likely but it’s used in very low quantities. Questionable spices are ginger, cloves, and vanilla, and some people just go with pumpkin pie spice rather than blending any. I knew I wanted to pick my own so that was out of the running. I felt that cloves might work but they have a really powerful flavor, and sometimes brewer’s yeast can produce clove-like flavors when not treated correctly. I didn’t want anybody to be turned off by the beer because of perceived defects so cloves were out. Ginger was easy to eliminate because I personally feel it doesn’t work well in pumpkin pie – its sharp, bright, piquancy has such a different emphasis from the traditional warm, savory flavors in a pumpkin pie. As for quantities, homebrew recipes online were all over the place. Online forums are great sources of information for homebrewers, but you really have to do a lot of research and average out everybody else’s recipes. Unfortunately you can’t trust everyone’s palette – when one guy puts a quarter cup of cinnamon in his batch and can barely taste it, you begin to distrust everyone as a result. It seemed to me that people were adding spices in similar quantities to making a single pumpkin pie, or maybe slightly more than that. My feeling was to treat the spices like hops are used in beer – have one addition towards the beginning of the boil that focuses on bitterness, and one towards the end that adds flavors and aromas. Even though this beer has a lot of specialty ingredients, the grains that go into it are still the most important part. Besides a typical does of base malts, you want to concentrate on specialty malts that amp up the dessert-like qualities of the beer. Depending on how sweet you want it, caramel malts will probably make up the largest part of your specialty grains. The darker roasted caramel malts add flavors like toffee, raisins, and plums, and the lighter ones add more sweetness, candy, and bright fruity flavors. Pretty much anything will work so long as you keep in mind that it’s easy to go overboard with the darker crystal malts. If you’re like me and want a really creamy mouthfeel, consider adding things like rolled oats or barley, wheat malt, or carapils. All of them will thicken the body in different ways, and you can further emphasize this characteristic by slightly under-carbonating your beer. I find that these two techniques create a sensation like drinking a latte – thick foam sitting on top of a rich beverage. When it comes to bitterness, I feel that pumpkin ales should have extremely few IBUs (International Bittering Units). I get some pushback on these opinions from other brewers, but I think the point is to make a dessert beer. If you increase the bitterness, yes you’ll increase that “thirst quenching factor” (when you have a sip of a beer and the sensation in the back of your throat says, “Have another sip!”), but I think it takes away from the sweetness and the pie-simulation. Also, I feel that the spices add their own kind of bitterness to the beer that helps to balance everything out. Finally, there’s the yeast selection. American ale yeasts have pretty neutral flavors that let the beer ingredients shine forward on their own. I’m partial to English yeasts because they’re extra malty and really transform the beer into something unique. They’re a little sweeter, however, so make sure to keep the sweet/bitter balance in check if you go this route. So those are my thoughts, and you’ll find my two recipes below. I love this style of beer because there’s so much to discuss, and one person’s perfect pumpkin ale could be completely different from someone else’s. When you go out to buy commercial examples, try to snag a few at the same time and do some taste testing. The amount of variation is astonishing, and pitting a few against each other will make it easier to pick out subtleties in each one. Cheers! Mash at 155*, including the pumpkin. If you’re an extract brewer, maybe just use one 15oz can of pumpkin in the boil, but keep in mind how much volume you’ll lose when you transfer to the fermenter. You might want to strain the wort through a paint strainer. The variety of hops doesn’t really matter when you’re adding this little… I was just using up what I had. Pitched with a 2qt starter of yeast 1056 – California Ale Yeast. I fermented for 7 days, then added 1 vanilla bean that I split lengthwise, scraped out the goo, and then threw everything into the fermenter for another 9 days. Then I bottled and let carbonate. Mashed at 160* (which was an overshoot of my 155* target). The differences between this recipes are switching flaked barley for oats (cause it’s KERF, man! ), subbing carapils for the carafoam and caramunich, and adding some whole cane sugar. The reasons for these last two changes are covered in the yeast section below. I didn’t add the vanilla this time around because I didn’t think it added that much in the final beer. This time around, I opted to pitch a 1gal starter of WLP004 – Irish Ale Yeast. I was planning on using English yeast but the homebrew shop was out, so I thought this would be the next best choice. It’s still a little sweeter than American yeast, and it has nice flocculation. Because I overshot the mash temp, I added the cane sugar to dry the beer out. Also, the grain changes were due to this being a sweeter yeast as well. As you can see, I kept the spices the same! I’ll have to report back with my thoughts on batch #2 when it’s done fermenting, but overall I like my recipes. They achieve a nice balance, and I think they taste like what somebody expects when you hand them a beer and say, “It’s a pumpkin ale!” Noticeable spice but not overwhelming, heavy and creamy body, light sweetness and toasty flavors. I hope this post inspires you to go out and buy or brew your own! What’s your favorite pumpkin beer?! See you from DC! I’m a beer hater and proud! It’s okay, Freya! Beer isn’t for everyone. Hmmm, think you would be willing to ship me a six pack of the Cootonwood beer? Seriously, I would love to try it!! I am willing to do a trade. I will bake you anything (vanilla bean sugar cookies?) and send them your way. Let me know if you would be interested. I am a HUGE fan of beer, and based on the beers you post, we have very similar taste. I think I am digging myself in a hole offering to ship beer. Does anyone know if it IS legal!? I need to get some pumpkin ale in my life! Only had it once, can’t remember. I just forwarded this to my boyfriend, the beer lover 🙂 I’ve had the Dogfish and the Williamsburg, and a few others on tap whose names I don’t remember!! So interesting!! I love pumpkin ales! Schafly is the best, hands down. Saranac Pumpkin is my favorite, followed by Dogfish Punkin. I HATE Shipyard Pumpkin. Hate, hate, hate! and since my background is in biochemical engineering–I love this type of stuff….. I am dying to start brewing beers. My husband is a true beer lover and he was diagnosed with celiac last year. Sadly, while they do make gluten free, he loves a darker beer and really wants to be able to control more of the flavor. I have done some research, but I need to get back in it. Thanks for the info…I hope to put it to use soon! Have a safe trip! Hey Kath! I’m Amanda and I’ve been reading your blog for probably close to two years. Many a little less, but I’m not quite sure. 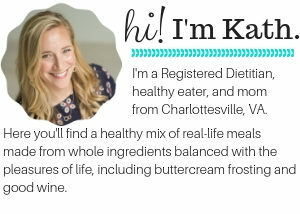 I’ve always been really inspired by your view on food and recently on your becoming an R.D. That’s sort of why I’m contacting you. (I never comment.) I’m a freshman in college, and have recently decided that my goal (and in all honesty perfect career) would be as an R.D. I’m looking for someone that’s been through what it takes to get there to give me a heads up. I looked all over your site for your email but I couldn’t find it. Is there any way to contact you? Thanks! Hey Amanda, It’s Katheats at Gmail dot com. Forwarding this post to my homebrewing-husband, right now! Thanks!! Great post! Punkin Ale is my most favorite type of beer and I wait all summer for it to be released at the beginning of fall! I live in MD and the Dogfish Head brewery is only a few hours away, so needless to say, I’ve been there numorous times and am OBSESSED with their Punkin Ale!!! It is my ultimate most favorite beer in the world (that I’ve had so far). Can’t wait to try the other Punkin suggestions you mentioned! Now I need to seek out some pumpkin beers! I NEED to get my hands on some Pumpkin Beer! Asap! I tried a couple of pumpkin beers last year, but I can’t remember them right now! Definitely Jack’s Pumpkin Spice, and a couple others. So far this year, I’ve tried Dogfish Head and loved it. I’m going to look for Schlafly and Pumpking if I can find them down here. My brother in law brews his own beer, I’ll have to ask him to make some pumpkin/fall beer! Thanks for the info Matt! Pumpkin beer is my favorite followed by peach. I’m typically a wine or vodka soda girl but I’ll trade them for a good pumpkin beer or even Oktoberfest. I would have to say that I’m more of a summer lover but I do love the flavors of fall. Wow thank you BOTH so much for this post. Matt, my husband brews beer after reading this post I quickly forwarded it on to him. I can’t wait to try out one or both of the recipes. I will be sure to email Kath once we have them bottled. I wonder if I can ship you a few? Hummm something to thing about. Anyway thanks again guys, have a great weekend! Of course I come to this blog to get my daily dose of Kath, but I love reading Matt’s mini-posts too! It’s incredible the brewing expertise he has – I wish I could try one of the Younger homebrews on day! But I had to comment about pumpkin beers – this week is actually the first time I’ve ever tried them. I consulted some fellow shoppers at Whole Foods the other day in the beer section and came out with Shipyard Brewing Company’s Pumpkinhead Ale (from Portland, Maine) and Dogfish Head Punkin Ale. I loved them both! Shipyard was more pumpkin-y, and Dogfish Head’s take was more beer-like and slightly more bitter. I definitely recommend that you try the Shipyard if you haven’t – I didn’t see it listed as something you’ve tried before! i know this is irrelevent when discussing good-quality, strong beers, but out of curiousity- how many calories do you guesstimate is in one of those bottles? 200ish? My appreciation for good beer makes it impossible to drink a bud light anymore, but man the calories on microbrews add up a lot faster than wine. In a 12 oz bottle? Probably 150. I actually really like the Post Road! I obviously love Dogfish Head Punkin and just recently tried Wolaver’s (which was good, but sort of forgetable). I don’t particularly care for the Smuttynose pumkin. My best friend lives in St. Louis so I drink Schafly beer whenever I go out there, and it’s sometime hard to find here in MD, but I realllly want to try their pumkin ale because I love all the rest of their beers! Love pumpkin ale! I wish we brewed our own beer. My fridge is currently stocked with Dogfish Head Punkin, but I’m dying to try Schafly or Pumpking! This is awesome–thanks Matt and Kath! Kath, I read your blog daily, but usually don’t comment. This might actually count as a delurk! Anyway, I’m a HUGE pumpkin beer fan. In fact, I would love to homebrew. My bf and I have loved micobrews for years. It would be so cool to start making some creations of our own! I love to cook, and I’m sure it would activate the same creative centers in my brain. My favorite pumpkin beer might be Shipyard, even though I saw someone mention above that they hate it. I find it incredibly smooth. I do like Blue Moon’s pumpkin ale, although it isn’t my favorite. I think Matt’s comments about the IBUs and smoothness are right on, and Blue Moon certainly didn’t take that approach. It’s really more an Oktoberfest style than a Pumpkin, in my opinion. Do you have an info on starting to homebrew for those interested? Any good sites you recommend? I just ran out & bought Dogfishhead Punkin for tonight! I love pumpkin beers – Shipyard is definitely my favorite. I haven’t seen the Schafly here (Charlotte), but I’ll be on the lookout for it. I just tried the Big Boss Harvest Time last night. It’s a good beer but not really pumpkin-y. I tried the Blue Moon Pumpkin and was so bummed it wasn’t that great. But then, I’m a pretty hard sell when it comes to beer. Maybe I should make Matt’s recipe. I’m sure home brew tastes heaps better than the big brewers. I’ve always wanted to try pumpkin ale. One more year until 21!! Thanks for the info Matt! I would like to try to do some brewing one day. Maybe I will marry a man who also likes beer as much as I do. If you guys ever visit Williamsburg Va for any reason please let me know!!!! There is a wine festival here Oct. 3rd put on by the Blue Talon you guys should check it out. Thanks so much for narrowing down the pumpkin beer choices! As much as I love pumpkin beer, the last few years I haven’t picked a tasty one, and since I don’t go through much beer in the season I only have a couple of chances to get it right! I’ll definitely seek out the ones you thought were good! I’ve only had one pumpkin that I really loved, and the brewery doesn’t bottle it. boooo. mmmmmm these recipes are so impressive!!!! I just had a bottle of the Kennebunkport pumpkin ale, which I found at Trader Joe’s. I liked it, but was hoping for a stronger pumpkin flavor. Will have to hunt down other breweries. Oh we HATED that one! I’ve only had pumpkin beer once and didn’t notice much of a flavor difference? I bet cooking with pumpkin beer would yield some tasty recipes! I’ve never acutally tried a pumpin ale, but Matt’s write up makes me want some! I like Matt’s vision of creating a “dessert beer.” That is likely the only type of beer I would like! Just found your site and am already hooked. The ONLY beer I will drink is pumpkin ale, and Cottonwood is hands-down the BEST! The original brewery used to be located just down the street from where I live (which is also in NC…where are you?) I’m so sad that they’re gone 🙁 I just tried the Dogfish one the other day and it’s pretty good. I’m going to have to get my husband to make me some pumpkin beer since he’s just getting into the homebrew hobby. We lived in Charlotte until a month ago and went to Davidson. I don’t think Carolina Beer Co shut down!? In Mooresville? Cottonwood Brewery used to be in Boone (where I live) before they sold their co. to Carolina Beer Co. They were located right down the street from my house and had a restaurant and everything…so sad they’re gone!!! Wow, can you send me some when its done?! I’ve never had pumpkin beer but now I want some!! I really want to try pumpkin beer now. I used to hate beer, but I am slowly starting to love it (thanks to my husband!). 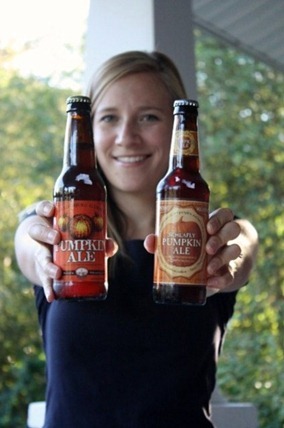 I love how passionate you guys are about your pumpkin ales…too cute! Oh how i wish i could find pumpkin beer in Canada. I live in Toronto, if there are any other GTA area readers who know where to get some pumpkin beer or even where i could have a pint at a bar, please let me know!! It’s hilarious Kath, i’m always telling my friends how the Americans are so lucky for their easy access to Trader Joe’s, Target, tart fro-yo, greek yogurt… now i have to add pumpkin beer to the list! I’m a proud Canadian, but i am often envious of my sisters to the south!! I normally turn up my nose to beer. I’m a white wine kinda girl. If you turn your nose up I don’t think you’ve had enough tastes of the good ones! I’ve never been a fan of the taste of beer but this sounds delicious! your husband is a great writer, good points but i still don’t like beer! I live in Vermont and my favorite, favorite, favorite pumpkin beer is Wolaver’s Organic Will Stevens Pumpkin Ale. I’m not sure if it’s available outside the state but you should definitely grab it if you see it! This post is great and awesomely timed. My husband and I were planning on making pumpkin beer on Sunday! Thanks for the advice, my plan was to just add things (pumpkin, cinnamon, ect) and hope it tasted good, but now I can hopefully follow some of that advice. I’m not really a beer drinker, but I was excited to see the Schlafly on your list (and in your hand) — it’s brewed right here in St. Louis 🙂 I do love the flavors of fall though! 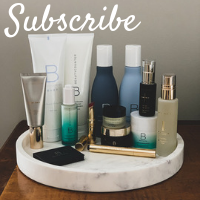 I’ve been reading your blog for about 6 months & it’s one of my favs! Thanks so much for posting the pumpkin beer recipes– both my husband and my brother have tried to make pumpkin ale to no avail. Great Post! My favorite pumpkin beer is Dogfishhead, Steves homebrew pumpkin ale is a up there too, similar to Dogfishhead but less alcohol. I refuse to drink blue moon pumpkin beer aka coors 🙂 ( I destest major breweries trying to look like they are microbreweres) You should try the real thing next time and roast a couple of sugar pies, I think it makes a difference. I am an avid reader of your blog, I just love it. Have you ever tried Fegley’s Brewworks Devious Imperial Pumpkin? It’s fantastic. I actually just had Jack’s Pumpkin Spice tonight and loved it! I also had a Sierra Nevada Tumbler tonight which was soooo delicious and smooth and desserty. I bet you would actually like that one Kath (though it is not really a pumpking beer, just an “autumn ale”. I am sooo jealous of your “butterbeer”! I am going to have to try and track that one down, hopefully I can find some Southern Tier up north! I never have beer, so how fortuitous that I had some samplings today just in time to read Matt’s homebrew advice! Loved the post! I looked for that Schlafly pumpkin ale today at Bevmo. But couldn’t find it!! Do you think it’s only sold locally to you? Have you tried the Shipyard pumpkin ale? That’s actually the only brand I could find.